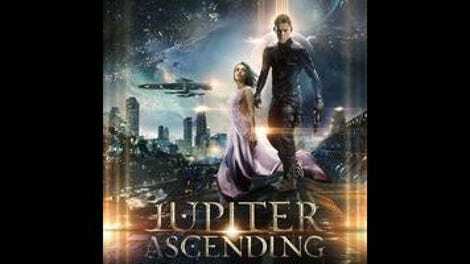 In Jupiter Ascending—an imaginatively goofy, Rococo space opera written and directed by Andy and Lana Wachowski, the sibling duo behind The Matrix, the live-action Speed Racer, and most of Cloud Atlas—an Anglo-Russian housecleaner is whisked away from Chicago by a pointy-eared, half-albino dog-man, and finds herself embroiled in a convoluted conspiracy that involves intergalactic tax codes, inheritance law, pseudo-incestuous marriage, an economy that takes human capital literally, and characters with names like Titus Abrasax and Chicanery Night. It is, in other words, just a few musical numbers and a whiff of marijuana smoke short of being the Thomas Pynchon book of big-budget, effects-driven movie sci-fi. What’s sort of remarkable is the way the Wachowskis manage to digest all of their high- and low-brow influences into something like a cohesive worldview. These influences include, but are not limited to: Moebius; David Lynch’s Dune; entry-level critiques of capitalism; the 1980 Flash Gordon movie; Brazil, which gets both a dialogue reference (“27b-stroke-6”) and a Terry Gilliam cameo; spiritual transmigration; personal transformation; transhumanism. It might not be as compelling a synthesis of pop philosophy and geek tastes as The Matrix, but it feels personal in the way that big-budget, effects-driven movies rarely do. Maybe the sibling thing has something to do with it—that is, this is not just a unique vision, but a shared, hashed-out vision. 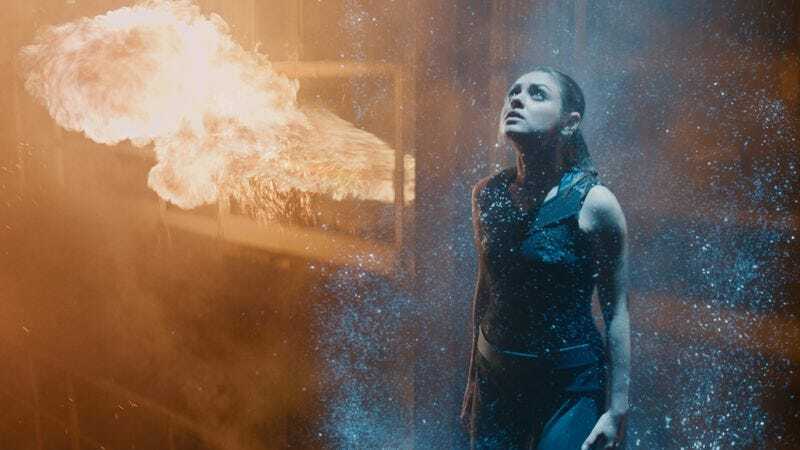 Jupiter Ascending stars Mila Kunis as Jupiter Jones, a mouthy, hard-luck everywoman who discovers that, due to a genetic fluke, she’s legally entitled to the holdings of the Abrasax family, a space-faring, clinically immortal merchant house whose portfolio includes modern-day Earth. (Long story short: Humans evolved a billion years ago in a different corner of the galaxy, and have dominated the interstellar economy for hundreds of millions of years by seeding planets with their genetic material, for reasons that Jupiter Ascending withholds until the halfway point.) She is pursued by rival bounty hunters, including Caine Wise (Channing Tatum, because why not), the aforementioned half-albino dog-man, who was kicked off the space police for ripping someone’s throat out with his teeth, had his wings surgically removed, and now doesn’t go anywhere without a pair of hover roller-blades. Pretty soon, Jupiter and Caine—who’s the principled kind of former-winged, pointy-eared, canine-hybrid bounty hunter—meet up with Stinger (Sean Bean), a fellow ex-space-cop who has retired to Earth to lead a low-profile life in a house full of bees. “Pretty soon,” in this case, means after two attempted alien abductions, a subplot involving Jupiter’s Russian cousin and an egg-donation scam, the large-scale destruction and reconstruction of Chicago’s South Loop, intimations of a mass memory-wiping conspiracy, and plenty of cuts away to the scheming Abrasax siblings, one of whom lives inside the planet Jupiter’s Great Red Spot with his retinue of mouse people and dragons. Jupiter Ascending is not an easy movie to summarize; a viewer would probably need a diagram to work out the conflicting schemes of the Abrasaxes—Titus (Douglas Booth), Kalique (Tuppence Middleton), and Balem (Eddie Redmayne, speaking in a compressed, Brando-esque whisper)—who are also, legally speaking, Jupiter’s children. And, anyway, a plot-point-by-plot-point summary couldn’t even begin to take into account all of the birdmen, elephant people, android lawyers, magical technologies, and gothic spaceships populating the edges of the frame, or the movie’s gonzo internal mythology, in which genes are both a currency and a religion. All of these things fit into a vision that should be familiar to anyone who’s seen The Matrix: a world of secret knowledge, where humans live unaware that they are nodes in a system that depends on their ignorance—a system that, in this case, happens to be capitalism. It’s hard not to admire the movie’s integrity: It’s a big, effects-heavy spectacle that works exclusively on its own terms, and despite being packed with incident, in-jokes, and vampire-aristocrat intrigue, it’s a breeze—partly because the Wachowskis excel at managing and integrating effects, and partly because the screwy fantasy they’ve created is so fun to navigate.